This morning held a surprise I didn’t want to see. When I went to open the backyard coop, I discovered our sweet Lola Rooster had lost a battle with a predator–likely a raccoon or weasel. Lola, so named because “she” turned out to be a “he”, had suffered an injury in his early chick days that left him with a foot that never healed properly and made him unable to put weight on that leg. His mobility was greatly impacted and this made it unsafe for him to remain in his flock. In the world of chickens, a deformity often leads to the other chickens ganging up on the weak one and killing it. So, when it was time for the other chicks to graduate from the brooder shed into the egg-mobile, Lola didn’t make the move. He became a pet and lived alone in the shed behind our house. 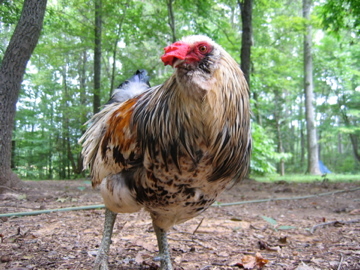 He rarely left the coop, though his door was opened everyday. Sometimes on pretty days, I’d put him outside, but he never stayed out long. I imagine he felt too vulnerable. Ray felt sorry for him and thought he might be in pain and suggested that maybe we should put him down. But when I held Lola and talked to him, and asked him if he was hurting, he cooed in a way that told me he was not hurting, at least not physically. Last summer, we were able to introduce 5 chicks into his house, and he accepted them. Four of those chicks turned out to be roosters, and when they got older and began to be aggressive toward Frankie the lone pullet (young female chicken), Lola would intervene. As they grew, Frankie preferred the company of Sue, one of the beautiful young roosters, and she spent her days with him, happily exploring far and wide, pecking and eating bugs and eventually laying eggs in all sorts of interesting places. But every evening, they would return to the coop to roost with Lola. I think Lola liked their company because he began to spend more time outside, still never going far from the coop, but sometimes hanging out with the other two for a while. Last week, the predator gave us our first surprise, killing Frankie inside the coop and likely Sue outside the coop, because he has disappeared. I checked the coop for cracks and set up a have-a-heart trap which the predator has managed to outsmart, eating the bait, and not getting caught in the trap. And then this morning it was Lola. His body was still warm when I held him to examine his fatal wounds and I cried. A lot. I feel like I failed to provide a safe place for this gentle creature, yet I know I did the best I know how to do, and that his days were pretty good days. I usually take dead birds out in the woods so other creatures can get nourishment from them. But I buried Lola in our dense Chatham County clay, beside Petey and Lucy and Hally, with St. Francis watching over them all. Tomorrow morning, when I’m having my coffee and devotional time, I’m going to miss Lola’s crow, enthusiastically greeting the rising sun and heralding the new day. Most days on the farm there are plenty of new lessons. This old one though, the one about how short and precious life is, is probably the hardest. Want To Hear Some Really Good News From Chatham County?